As was the case with most areas along the shores of the Great Lakes, Sturgeon Bay gained its initial prosperity through the lumbering of the seemingly endless forests that surround the lake. However, with the declining availability of lumber resulting from clear-cutting, the area was under a metamorphosis as a shipbuilding center. With vessels required to sail completely around the peninsula and through Death's Door to make entry into the port of Green Bay and the boatyards in Sturgeon Bay, a group of local business interests under the urging of Joseph Harris, Sr. the editor of the Door County Advocate, conceived the idea of excavating a canal through the swampy ground between Lake Michigan and Sturgeon Bay to drastically shorten the route of navigation. The Sturgeon Bay and Lake Michigan Ship Canal and Harbor Company was formed, shares were sold and excavation began in 1872. By 1880, work had progressed to the point that small vessels were able to negotiate the new cut, and with opening for larger vessels planned for 1882, the Company realized that an aid to navigation was needed to guide vessels into the western end of the waterway. An agreement was reached with the Lighthouse Board whereby the Board agreed to establish a light station if the company would purchase the necessary land and deed it over to the Federal Government. In March 1880, a site atop a thirty-foot limestone bluff known as Sherwood Point was selected for the station, a 1.1-acre site surveyed, and negotiations were underway to obtain clear title for the site. While Congress appropriated the $12,000 for the station's construction on March 31, 188, the matter of title to the site was not resolved until 188, and thus construction did not begin until May 14, when the lighthouse tender WARRINGTON anchored off Sawyers Harbor as a working party of 20 men labored to lighter all of the building materials to shore. After clearing and grading a road from Sawyers Harbor to the station site, the building materials and supplies were transported to the work site by team, and work began in earnest. A cellar was blasted into the rock, which the masons lined with rubble stone gleaned from the site after the blasting process. Beneath what would end up being the kitchen end of the cellar, a 1,500-gallon brick cistern was erected to hold drinking water, its interior surfaces lined with a plaster coating. By June 30, four courses of red brick had been laid atop the rubble stone foundation walls, a brick-lined drain had been laid leading from the cellar to the bluff face, and a 4" diameter well had been drilled through the rock to a depth of 42 feet, and piped into the cistern in the cellar. The structure that took shape over the remainder of the summer was the first of a design that would be duplicated the following year at Little Traverse and Baraga. Taking the form of a two and a half story red brick dwelling containing six rooms with a square tower 8' 5" in plan with walls 12" in thickness integrated into the center of the north gable end. A double flight of wooden stairs within the tower lead from the first floor to an open landing on the second floor, and served as the only connection between the two floors. To tower was capped with a square cast iron gallery floor, on which a decagonal prefabricated cast iron lantern seven feet in diameter was centered. Access to the lantern was provided by a steep set of stairs leading from the second floor landing to a scuttle in the lantern floor equipped with a cast iron door. The lantern was in turn capped by a roof consisting of ten prefabricated cast iron sections, and crowned with a cast iron ventilator ball with a brass lightning spike tipped with platinum. A ¾" diameter wrought iron lightning conductor was attached to the lower side of the iron lantern deck, and lead down the exterior of the brick tower through I bolts to a ground rod sunk into the bedrock twelve feet away from the tower. Bolted to the center of the lantern floor, a cast iron pedestal served as a mounting base for the station's illuminating apparatus. The district Lampist, Mr. Crump, arrived at the station, and carefully uncrated the station's new Fourth Order Fresnel lens which had been manufactured in France and shipped to the station by way of the central depot in Staten Island and the district depot in Detroit. After the components were carefully carried into the lantern, the lens was assembled atop the pedestal. Designed to exhibit fixed white characteristic with a red flash every sixty seconds, the lens was outfitted with an external ring outfitted with prismatic ruby colored glass flash panels which rotated around the outside the lens. Power for rotating the three ruby panels was provided by a fan regulated clockwork mechanism connected to the ring by a series of gears. A steel cable 22 feet in length was wound around a drum within the clockworks, with the cable routed through the lantern floor to a vertical shaft within the west wall of the tower, and a heavy weight attached to the lower end of the cable. This weight slowly dropped down within the shaft, it turned the drum, thereby rotating the panels attached to the outer ring. 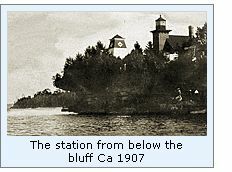 By virtue of the station's location atop the bluff, the lens sat at a focal plane of 60 feet above lake level, and would be visible for a distance of 15 miles in clear weather. With construction of a wood barn, wood shed and brick privy, and the laying of timber walkways connecting the structures, work at the station was considered complete on September 28. Henry Stanley, keeper of the Eagle Bluff light station for the past 15 years was selected as the new station's keeper, and while he appears on district payroll records as being assigned to Sherwood Point on September 20, he did not officially display the new light until the night of October 10, 1883. Soon after taking over the station, Stanley began to experience problems with the lens clockworks, having to pay for a Sturgeons Bay clockmaker to make the trip to station in an attempt to effect repairs. In 1884, Keeper Stanley's niece Minnie Hesh arrived at the station from New York to spend some time with the Stanleys at the station while recovering from the sudden death or her parent. Evidently finding the area to her liking, Minnie decided to take up residence in the area, and eventually married William Cochems, the son of a prominent Sturgeons Bay businessman in 1889. After seven years of supplying the station through the time consuming process of lightering from anchored supply tenders to Sawyers Harbor and thence along the rough half mile trail to the lighthouse, District engineer Major William Ludlow requested a the sum of $100 to purchase a small parcel of land adjacent to the station on which he planned to erect a landing crib and stairs leading up the bluff to the station. Concurring with the need, Congress appropriated the requested sum on August 30, 1899, and steps were undertaken to obtain title to the selected parcel. Stanley's problems with the lens became so well known in the area, that on October 4, 1890 the Door County Advocate took up Stanleys cause, commenting that he had "no end of trouble since entering his duties down there to make the thing work at all times, it being frequently necessary for him or an assistant to move the machinery by hand." Clear title to the required land was finally obtained on September 17, 1891, and a crew arrived at the station that season to erect the necessary cribs and stairs for the delivery of supplies. That winter, the decision was made to establish a fog signal at the station to serve mariners making their way into the canal entrance in thick and foggy weather. 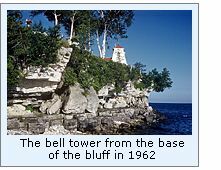 To this end, in the Spring of 1892, a work crew was dispatched from Detroit to erect a square timber-framed pyramidal structure to house the new fog bell at the upper edge of the bluff in front of the lighthouse tower. Sheathed in horizontal siding, the structure featured a shingled roof and four diamond-shaped windows on the upper walls to allow light into the building's interior. A 600-pound bronze bell was attached to the lakeward wall of the structure and an automated bell striking mechanism within the structure and connected to a hammer which was hinged to strike the bell on the outer wall through an opening in the wall. Similar to the lens rotation mechanism, the bell striker consisted of a clockwork motor, and required winding every four hours when the bell was in operation ringing out its characteristic single strike every 12 seconds. To make the new tower match the appearance of the existing structures, the lower section of the tower was painted a dark buff color and the upper section slate gray. 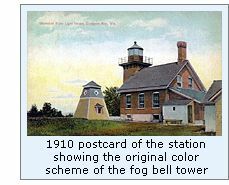 Work on the tower was completed, and the new fog bell placed officially into operation on July 1, 1892. By 1894, Stanley was 70 years old, and responsible for both a difficult lighting apparatus and a fog signal, he managed to convince Ninth District Inspector Commander John J. Brice that an assistant was needed at the station to keep up with the increased workload. Stanley likely pulled some strings to have his niece Minnie's husband William appointed to the position, and Minnie and William Cochems moved into the station with the Stanleys on November 10, 1894. After suffering from illness for almost a year, Stanley passed away on October 13, 1895. Surprisingly, a few weeks thereafter Cochems was promoted to the position of Keeper of the Sherwood Point Light and Katherine Stanley was appointed as his assistant. Evidently, Cochems continued to experience problems with the operation of the lens rotating mechanism, as the Ninth District Lampist arrived at the station on March 23, 1898, and replaced the entire lens, pedestal and rotating mechanism with the illuminating apparatus previously installed at the Passage Island light, along with a new ball bearing rotating mechanism. Deciding to retire from lighthouse service, Katherine Stanley resigned her position on June 24 of this same year, and Minnie Cochems was appointed to replace her on Katherine's departure, and William and Minnie had the lighthouse to themselves and their children, and took great pride in maintaining the lighthouse grounds in pristine condition. Since the earliest days of the US lighthouse service, lard and sperm oil ware used for fueling the lamps. Relatively non-volatile, the oil was stored in special rooms in lighthouse cellars or in the dwelling itself. With a change to the significantly more volatile kerosene, a number of devastating dwelling fires were experienced, and beginning late in the 1880's the Lighthouse Board began building separate oil storage buildings at all US light stations. As a result, it was surprising that the Sturgeon Point light was never equipped with a separate oil storage building . This situation was rectified in 1902 when a work crew and materials were delivered at the station and a brick oil storage building was erected a safe distance from the main building. Three years later, another crew arrived at the station and replaced all of the timber walkways with concrete. The district Lampist returned to the station on April 25, 1917 and upgraded the lamp to an incandescent oil vapor system, thereby increasing the output of the fixed white light to 1,700 candlepower and the red flash to 4,300 candlepower. As Minnie was getting out of bed on August 17, 1928, she collapsed and passed away. 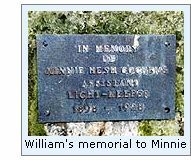 In tribute to his late wife, William placed a plaque on a stone pedestal in the garden to the east of the station which read "In memory of Minnie Hesh Cochems, Assistant Light-Keeper, 1898 - 1928." With the arrival of electrical power in the area, the station and light were electrified in 1930. After Minnie's death, the position of assistant at the station was never refilled, and this may have served as a contributing factor to William's decision to retire from lighthouse service three years later on July 1, 1933 after almost 39 years of service at the station. Conrad Stram was transferred to Sherwood Point from the Sturgeon Bay Canal light where he had served for the past six years. 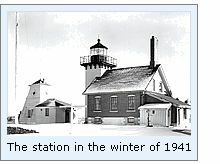 With establishment of the automated Peshtigo Reef light on August 26, 1935, supervision, maintenance and operation of the new light were added to Stram's responsibilities. However, Stram would be required to operate both lights and the fog signal single-handedly. With plans for the establishment of a radiobeacon at the station for 1940, First and Second Assistant's were assigned to the station in 1939. With the Coast Guard's assumption of responsibility for the nation's aids to navigation in 1939, the civilian keepers were given the alternative of either transferring into the Cost Guard or maintaining their civilian status, which was the alternative chosen by Stram. The fog signal was automated in 1940 through the installation of electrically-operated diaphragm horns, and with the automated bell ringing apparatus removed, the bell tower was converted into a radio room. The following year, Stram changed his mind, and transferred into the Coast Guard, and continued to serve as keeper of the Sherwood Point Light until he retired in 1945. Coast Guard crews continued to man the Sherwood Point station through the fall of 1983, when the light was the last on the Great Lakes to be automated. With the litharge which held the lens prisms in place found to be significantly deteriorated as a result of constant exposure to the sun's ultraviolet rays and a lack of daily maintenance by full time keepers, the Fresnel lens was removed from the lantern on October 21, 2002 and replaced by a 300 mm acrylic optic. The historic Fourth Order lens was transported to the Door County Maritime Museum where it was restored by Coast Guard Lampist Jim Woodward, and can currently be seen on display. 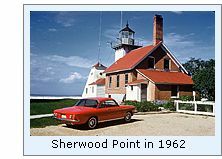 Click Here to see a complete listing of all Sherwood Point Light keepers compiled by Phyllis L. Tag of Great Lakes Lighthouse Research. This lighthouse is currently private Coast Guard property, and as such all access is closed to the public. We obtained specific permission from the Coast Guard to enter the grounds and take photographs for this website. However, the station is open to the public every year during the annual Door County Lighthouse Walk which is held in mid May every year.